IN BRITAIN'S IMPERIAL heyday, a phrase with uncertain provenance could be heard everywhere from Hong Kong to Bengal to Dublin: “The Empire on which the sun never sets.” The saying can be taken literally, or figuratively, or indeed both. First used, most likely, by King Xerxes I of Persia two-and-a-half millennia ago, it took the form of a monarchical promise that “the sun will then shine on no land beyond our borders; for I will pass through Europe from one end to the other, and with your aid make of all the lands which it contains one country.” Although this might not precisely anticipate the faltering European Union, it does speak tangibly of the unifying purpose of empire. Two thousand years later, Philip II of Spain is reported to have voiced the same sentiment after Spain took control of the Portuguese empire. 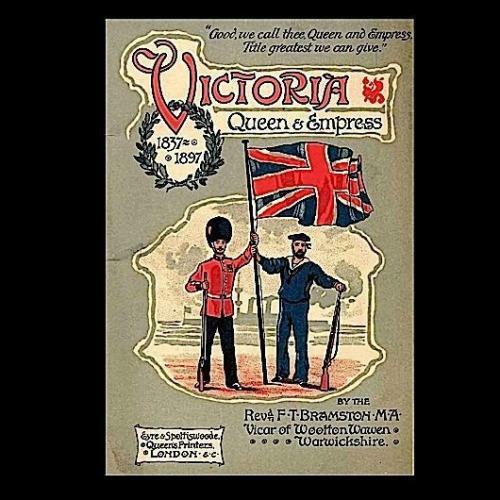 This lovely and informative book, published by the Bodleian Library at Oxford to accompany its trove of printed historical objects (the authors are, respectively, a military historian and a project manager at a British teaching and administrative committee), is full of images that navigate nearly every aspect of British imperialism. One page gives pictures from books that advertise Australian dried fruit and butter; another shows an advertisement for Canadian emigration, promising Englishmen “a new life in the colonies”; another offers a drawing of British "valor" during India’s Sepoy Mutiny in 1857; another displays an advertisement for Imperial Airways, which offered “Trans-African Services” to its fliers. And every image is helpfully accompanied by brief explanatory notes. The net effect is a more complete (although naturally biased) picture of the British Empire. On the surface, the book is somewhat of an implicit rebuke to the thesis put forward very ably by Bernard Porter, the historian who argued that a huge percentage of British citizens had no idea about the scope of the British Empire until nearly the end of the nineteenth century. Porter’s argument was itself somewhat of a rebuke to the Orientalist school, which had argued that Empire held a more central place in the British imagination. (Jones’s comment, made in its heyday, certainly suggests that information on the dark side of Empire was available to those who wanted to find it). And yet Illustrating Empire will also come as a surprise to those who believe all news of the Empire in the United Kingdom was militaristic or propagandistic. The photographs and the drawings, the advertisements and the bulletins, the poems and the pamphlets collected here give nuance and flavor to the way that ordinary English-people came into contact with news about overseas possessions. One illustration expresses a fear that settlement of Australia will mean an influx of foreign women (presumably because too many Englishwomen will have set sail). The drawing displays racially tinged xenophobia, to be sure, but it is in no way an advertisement for colonialism. Other drawings warn British travelers that going abroad can be dangerous and risky, and that over-excited citizens would do better to stay at home. Especially interesting is a reprinted pamphlet from an advocate of Home Rule for Ireland, and an opponent of the Boer War, who sought to connect imperialism with higher taxation and ever-powerful government. As these examples demonstrate, many of the objections to empire came from what might be called a Britain-first perspective, and they hardly seem reasonable or liberal-minded today. The opponents of empire, either because of their own bigotry, or because they understood the political currents of the time, would often cannily play on popular fears of the “other” to try and keep Britain focused on the homeland. It is thus probably correct to say that these arguments, even when sincere, abetted the forces of reaction by strengthening the idea that the rest of the world was not up to British standards. This, of course, was part of the reason that the Empire came into existence in the first place. Still, political debates cannot overshadow the charm of this book, even if every page is filled with pictures that are inherently political. My favorite drawing shows a popular board game from the 1850s, where players travel in concentric circles to ultimately reach London. Each square is a beautifully rendered portrait of a different colony. Other than London, the best square to land on is Jamaica, which offers players a free turn because the British had abolished the slave trade in that long-held colony. This is only one of many ironic twists that the reader will come upon. As the authors note, the “British Empire, and the engagement of Britain with the non-European world, is an integral part of British history.” Illustrating Empire allows us to see glimpses of that history as it was being made.